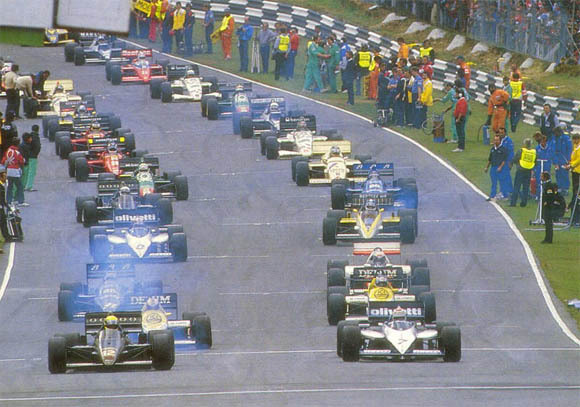 The 1985 Formula One European Grand Prix held at Brands Hatch on October 6, 1985. Nigel Mansell in the Williams Honda takes his first Grand Prix victory in front of the home crowd with Alain Prost finishing fourth to take the World Championship. John Watson returns for a one-off drive with McLaren after a 2 year absense in what will be his last GP. Have a look at Keke Rosberg blocking Senna for nearly 2 laps after a coming together then goes on from a lap down to take 3rd place! Alboreto has a great turbo fire (those were the days when you could count on a Ferrari engine blowing up!). Jaques Laffite makes a brief appearance in the top 6 and takes fastest lap before his Ligier expires, and Marc Surer in the BMW Brabham has a spectacular turbo blow up. The sleek, streamlined Brabham looks amazing compared with other cars and the simple blue/white colour scheme shows it off to best effect. This is in contrast to the McLaren which seems especially “fat”! For full race stats see Wikipedia or Forix. Also am interested in any Prost , Sena duels. Is this Mark Johnson relating to Route 65 motorcycles? I purchased one of your bikes and it was fab….your website has an excellent range of modern and classic motorcyles. Those were the days hugh..
Was very happy to find this. It was the first race I ever went to – at the age of 7. Brands Hatch was a great circuit for the cars of that era wasn’t it…. Hi, I’m an artist living out in Turkey, and I’ve been asked if I can do a painting of Ayrton Senna and Michael Schumacher on track together. Usually being asked to paint F1 cars isn’t a problem as I go to most GPs and take oodles of piccies, but, looking through my varied and various personal photo’s I have very little of any use from then. Has anyone any ideas where I might acquire images of the magnificent duo on track circa 1993/1994 ?